For someone in chronic pain, in this case, from degenerative hip disease, we know you will spend hours in front of a computer searching for information that will help you. The times you are searching the most are most likely the times when you are in a more acute painful situation. If you are like others we have helped, you have reached a point of hoping for and discussing with your doctors “hip preservation.” This means that your hip has not degenerated enough for hip replacement and that there is a chance that you can save your hip from replacement surgery. Hip replacement is an elective procedure. This means that means it is your choice to have it or not. For many people, even those with significant hip degeneration, if the hip still has a good range of motion, if walking is still doable for the most part pain free, if quality of life has not yet been significantly altered, hip replacement can be put off or in some cases avoided all together. We hope this article will offer you some insights and answers in helping you understand, manage and make decisions in regard to your chronic hip pain. Later in this article, we are going to present the evidence that many people can avoid hip replacement surgery with regenerative medicine injections. We are going to present realistic treatment outlines and discuss the regeneration of a diseased hip as opposed to replacing the hip. Why do people consider a hip replacement? Should you? Get rid of the constant pain. Get back to normal everyday activities such as walking, getting in and out of a car, getting on and off the toilet. Help you keep your job or your business because now you are getting to the point that you cannot work. Another reason that you are now considering hip replacement is that you are getting inadequate pain relief from anti-inflammatory drugs, physical therapy, or walking supports. You may have just returned from a follow-up visit to your orthopedic surgeon. Over time he/she may have been exploring conservative care options for you but now you have more pain and more hip instability following these treatments. Your hip may be making a lot of noise such as grinding, clicking and popping as a signal to you that something is not right. It may give way on a staircase, getting out of your car may now be a challenge. Let’s explore how you got here. One course of treatment is the conservative care treatment. This is usually a combination of painkillers, anti-inflammatory medications, physical therapy, hyaluronic acid injections, and cortisone injections. You may continue getting these treatments until such time as a hip replacement procedure is warranted. In this article we will discuss why exercise and physical therapy fail to restore muscle strength in hip osteoarthritis patients. 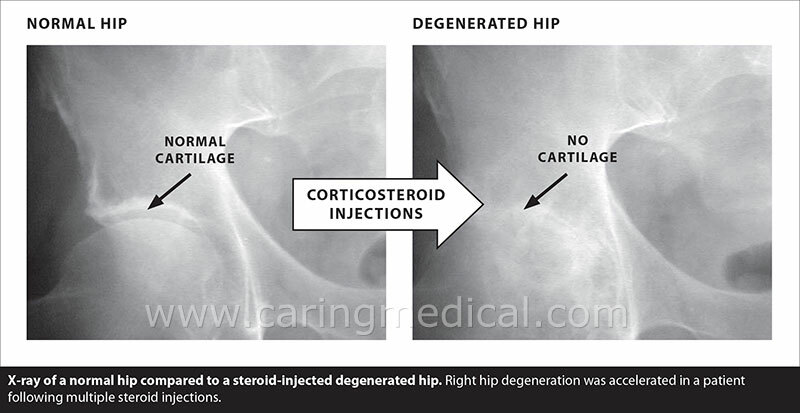 We do not recommend viscosupplementation for hip osteoarthritis, this article provides supported research and clinical observation. It also shows success with PRP or platelet rich plasma injections, a type of regenerative medicine treatment we utilize. Stronger Pain medications. This particular recommendation has very little long term appeal as it can make your situation worse. Please see our article, when Painkillers make pain worse. Corticosteroids / cortisone or steroid injection. (This is also a treatment we do not recommend. Please see my article Alternative to cortisone shots, in which I examine new research that is providing more warnings that cortisone does not heal and, in fact, accelerates deterioration of already damaged joints. On the surface, this statement may seem obvious. You can’t get pain relief so that is why you are considering hip replacement. However, the longer you avoid treatment and try to self manage, the worse you are making your hip. It is likely your pain relief medication ACCELERATED your need for hip replacement. For many people, this is difficult to understand. The irony, of course, is that conservative care treatments of traditional insurance-based medicine are supposed to help people avoid or delay the need for hip replacement. It actually accelerates the need. Note: Hip replacement may be the only option for people with advanced degenerative hip disease. This is where degeneration is so advanced that it that has deformed the hip ball and socket and caused a “frozen” or “locked” hip situation, a lot of pain, and loss of quality of life. In our opinion, this is the only time hip replacement should be considered the number 1 option but it should also be the number 1 option when regenerative medicine injections are not considered a realistic option. Whether you choose to have surgery or you are seeking not to have the surgery by using regenerative medicine injections, you need to function quickly and pain-free. There is a degree of urgency here because your hip will get worse and worse and at an accelerated rate. One of the first things that will happen if it has not already is that is that your hip will start causing you much more pain than your doctor or MRI shows. This is a critical time and we cover this patient problem in our article: Your hip hurts worse than your MRI is saying it should and your doctor doesn’t believe you. When you have more hip pain than an MRI is showing you should, your hip is sending signals to the brain that it is sinking. Treatment option: Prolotherapy injections. This is the injections of a dextrose, a simple sugar that provokes a healing response in damaged soft tissue. This would include the hip ligaments, the hip tendon’s attachments that connect muscle to bone (the enthesis), and the hip cartilage. Treatment option: Platelet Rich Plasma injections (PRP Therapy). This is an injection treatment that uses your blood platelets. This treatment also works on the soft tissue. We have an extensive article on Platelet Rich Plasma for treating Hip Osteoarthritis that goes deeper into this subject. We use bone marrow derived stem cells. We do not use this on every patient. Stem cell therapy utilizes cells from your own bone marrow to begin the regeneration process. This treatment is typically reserved for pAtients who have significant damage to their hips, but where there is a realistic expectation that the treatment will help the patient avoid a hip replacement. In the next section we will take a brief look at the success of hip replacement. Did hip replacement patients experience great improvements or did the doctors think the patients did and reported it as such? This is a point of contention in the medical industry. First, people do get good results with hip replacement, especially those with significant osteoarthritis caused deformities. But how good were the results for everybody? Researchers writing in the Public Library of Science health journal PLusOne (3) wrote that because there are many hip replacement component types and many techniques for surgical installation of these products, there is concern that medical research on the long-term effectiveness of the varying techniques is inconclusive due to poor reporting, missing data, or uncertainty in treatment estimates. In other words, doctors may have interpreted patient results as being much better than they actually were to support the use of a specific implant or specific technique. These findings were supported by other researchers including a 2018 study published in the journal BMC medical research methodology (4) which also found problems of accuracy in reporting patient success in hip replacement and suggested to doctors that results of the research that patients were happy with their hip replacements may not be as good as is being reported. Let’s move on now to solutions. What do hip ligaments have to do with bone on bone / no cartilage in my hip? Everything. If you fix my ligaments, can I avoid hip replacement? There’s a good chance, yes. Doctors who see patients with hip pain significant enough for a hip replacement recommendation soon or sometime in the future, tend to focus mainly on the bone-on-bone situation. It is very unlikely that you have seen an orthopedist who discussed anything but arthritis, joint space, cartilage and bone on bone. Now think to yourself, when did anyone talk to you about your hip ligaments? In the research below we are seeing that doctors are now accepting the fact that people do not wake up one morning with advancing bone on bone hip osteoarthritis. Something caused it. Bone on bone hip osteoarthritis is the end result of continued, prolonged, unrelenting hip joint erosion. What is causing this erosion? Now doctors are realizing that it is damaged, loose, hip ligaments. If we can fix the hip ligaments there is a good chance we an help the patient avoid a surgery. The white bands are ligaments. Notice that you cannot see the ball of the hip because they are surrounded by ligaments. How important are your hip ligaments when we talk about degenerative hip disease? How important are your hip ligaments to pain free and stable motion? Look at the simple illustration to the left. Look at the hip joint where the ball and socket meet. Where is the ball of hip? You can’t see it because it is wrapped in supportive ligaments. The hip works because those ligaments, along with the hip labrum, help hold the ball to the socket. The three main ligaments of the hip, the iliofemoral, pubofemoral and ischiofemoral ligaments are very strong. They keep your hip stable. When these ligaments are not strong your hip becomes unstable. When your hip is unstable it rips at the hip labrum and other supporting tissue. The ball starts to rub the socket the wrong way. This is what they call “wear and tear,” degeneration. The next time your hip is causing you pain, think to yourself, my hip is being rubbed the wrong way. Remarkable in their observations are recent studies that look at people who still had hip pain after hip replacement surgery. Since the bone-on-bone was alleviated by the hip replacement what could be causing the patient’s continued pain? Please see our article Greater trochanteric pain syndrome. Greater trochanteric pain syndrome begins with minor damage to the hip joint tissue, primarily the ligaments, and ends with destructive abnormal joint motion (hip instability) that leads to inflammation and eventual problems of degenerative hip disease. Ischiofemoral impingement, please see our article if you have severe buttock pain along with tenderness on the ischial tuberosity (the sit bones). Myofascial pain syndrome of the tensor fascia lata. This is a pain on the outside of the hip that originates with the tiny muscle on the outside of the pain that causes lot of pain. Gluteal muscle tears and strain, The gluteal muscle is a buttock muscle. As well as ligament sprains of the hip. Research: We know the hip ligaments are important, they may be more important than we think. As mentioned above, when you first go to a doctor with hip pain, it is rare for the doctor to acknowledge that your problem may be from the ligaments. The reason? Ligaments are not cartilage and they are not bone. It is easier to describe to someone that they have “bone on bone” than joint instability causing a premature arthritis condition. We know that the hip ligaments contribute to hip stability. We do not know how ligament damage affect men and women differently or how ligaments affect inside, outside, front or back hip pain. We do not know clearly know how ligaments interact with other tissues stabilizing the pelvis and hip joint, as research is scant. Again, the realization that limited range of motion and/or pain with motion may not be solely caused by a bone-on-bone situation has lead doctors to further understand the relationship of the hip ligaments to pain and limited range of motion and in our research in the Journal of Prolotherapy we showed that treating weakened ligaments helped patients avoid a hip replacement surgery and increase hip function. 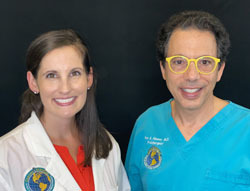 We are going to continue to see research that doctors are unclear of the extent of the importance of the hip ligaments in stabilizing and repairing hip problems and that a missed opportunity, the non-surgical repair of the ligaments that could be the crucial first step in hip surgery avoidance, is not being suggested to patients. This was pointed out in research from 2007 in the medical journal Arthroscopy, (7) which obviously specializes in surgical technique, here doctors wrote that doctors who understand the hip ligaments could offer non-surgical options for hip pain. They highlighted that the ischiofemoral ligament, iliofemoral ligament, pubofemoral ligament, iliofemoral ligament, all control internal rotation in flexion and extension. Understanding the independent functions of the hip ligaments therefore are essential in determining nonsurgical options. This research and that of another recent study points out what has been obvious to many Prolotherapy doctors over the years. You can’t save the hip (prevent hip replacement) without saving and repairing the hip ligaments. Hip ligaments prevent excessive range of motion and contributes to synovial fluid replenishment (the natural lubrication process of joints) at the cartilage surfaces of the joint that prevents friction and wear and tear. In order to restore their biomechanical function after hip surgery, you need to restore the hip ligaments to their normal tension. Surgical ligament repair is technically demanding, particularly for arthroscopic procedures, but failing to restore their function may increase the risk of osteoarthritic degeneration. This video is from 9 years ago. The concepts that you see in this video are still the concepts we practice today. We have 26 years experience in helping people avoid hip replacement. So know we have reached a point where we will discuss the alternative to treatments you have been trying for years without effectiveness. We will now turn to Prolotherapy injections. Caring Medical published its research in 2009 (9) where we looked at 61 patients, 33 of them had hip pain in both hips. Twenty of these patients were told that there were no treatment options available to them, with eight being recommended to surgery as their “only hope,” for hip pain alleviation. 54% were able to completely stop taking pain medications. Patients who had Pain, Crunching Sensation, Stiffness. In our study, we asked patients to rate their pain, crunching sensation and stiffness on a scale of 1 to 10. Score of 1 being no pain/crunching/stiffness and 10 being severe crippling pain/crunching/stiffness. Before: Score of 4.4 for stiffness. After: Score of 2.0/10 for crunching sensation. whereas after Prolotherapy only 2% had a pain level of eight or greater while 77% had a pain level of three or less. In our study, we asked patients to rate their pain, crunching sensation and stiffness on a scale of 1 to 7. 6 was normal motion, and 7 was excessive motion. Before: The average starting range of motion was 4.3 and ending range of motion was 5.1. Before Prolotherapy, 30% had very limited motion (49% or less of normal motion), this decreased to only five percent after Prolotherapy. Prior to Prolotherapy, only 36% had 75% or greater of the normal range of motion but this improved to 75% after Prolotherapy. Sixty percent of the patients discontinued pain medications altogether after Prolotherapy. In all, 75% of patients on medications at the start of Prolotherapy were able to decrease them by 75% or more after Prolotherapy. None of the patients had to increase pain medication usage after stopping Prolotherapy. Before Prolotherapy, the average patient was taking 1.1 pain medications but this decreased to 0.3 medications after Prolotherapy. 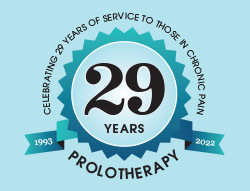 Before Prolotherapy, 23% of patients were on two or more pain medications, but this decreased to 2% after Prolotherapy. While 27% of patients could walk less than one block before Prolotherapy, all could walk greater than that distance after Prolotherapy. a total of 84% ranked it as at least somewhat compromised. After treatments: 80% of patients were able to do 30 or more minutes of exercise with 40% not being compromised at all. 40% reported an overall disability of at least 50% (could only do about half of the tasks they wanted to). Before receiving Prolotherapy, five of the patients were dependent on someone for activities of daily living (dressing self and additional general self care). All five regained complete independence after Prolotherapy. Before Prolotherapy, 11% considered themselves completely disabled in regards to their work situation, but this decreased to seven percent after Prolotherapy. 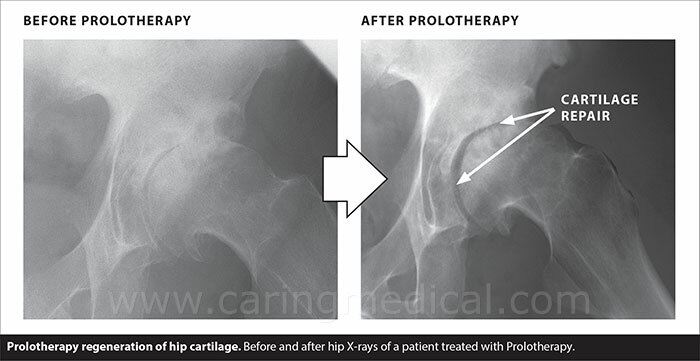 The results of this retrospective, uncontrolled, observational study, show that Prolotherapy helps decrease pain and improve the quality of life of patients with chronic hip pain. Decreases in pain and stiffness and improvements in range of motion reached statistical significance even in patients whose medical doctors said there were no other treatment options for their hip pain or that surgery was their only option. 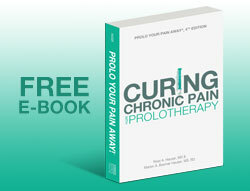 Ninety-five percent of patients stated their pain was better after Prolotherapy. Over 70% said the improvements in their pain, crunching and stiffness since their last Prolotherapy session have very much continued (75% or greater). Eighty-nine percent of patients stated Prolotherapy relieved them of at least 50% of their pain. Fifty-nine percent received greater than 75% pain relief. Only two patients had less than 25% of their pain relieved with Prolotherapy. Is Prolotherapy the right treatment for your hip pain and instability? When we receive hip x-rays from prospective patients via email, they provide a good assessment of how many Prolotherapy treatments might be needed to achieve the patient’s goals. Best assessment would be a physical examination in office. Rating a hip Prolotherapy Candidate: We will rate the potential hip pain patient on a sliding scale of being a very good Prolotherapy candidate to a very poor one. In a very good candidate’s x-ray, the ball of the femur will be round, fitting nicely into the socket in the pelvis, with good spacing between these two bones. This space is the cartilage that cushions and allows the femur to rotate freely within the socket. 1. Amount of joint space or cartilage that remains. 3. The shape of the femoral head itself. In very poor candidates, the hip does not even look like a hip anymore; the ball is flattened or egg-shaped and does not fit into the socket as well. Once the damage is this extensive, the patient will likely need a recommendation for total hip replacement. This is best explained with a visual presentation. 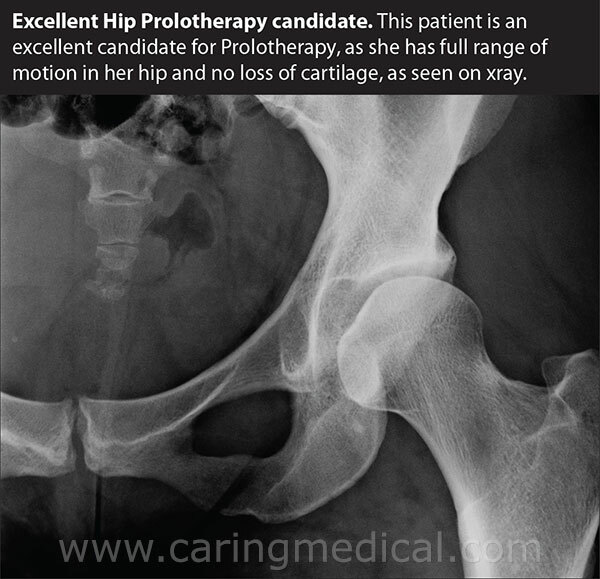 In the video below you will see a patient that was recommended to hip replacement but was actually a better candidate for Prolotherapy. When we receive hip x-rays on discs or film from prospective patients, they provide an estimated prognosis, which is their best assessment of how many treatments might be needed to achieve the patient’s goals. This is more difficult to assess when we do not have the opportunity to examine the patient in person. Rating a hip Prolotherapy Candidate: We will rate the potential hip pain patient on a sliding scale of being a very good Prolotherapy candidate to a very poor one. In a very good candidate’s x-ray, the ball of the femur will be round, fitting nicely into the socket in the pelvis, with good spacing between these two bones. This space is the cartilage that cushions and allows the femur to rotate freely within the socket. Amount of joint space or cartilage the patient shows. In very poor candidates, the hip does not even look like a hip anymore; the ball is flattened or egg-shaped and does not fit into the socket as well. Once the damage is so extensive, the patient will need a recommendation for total hip replacement. 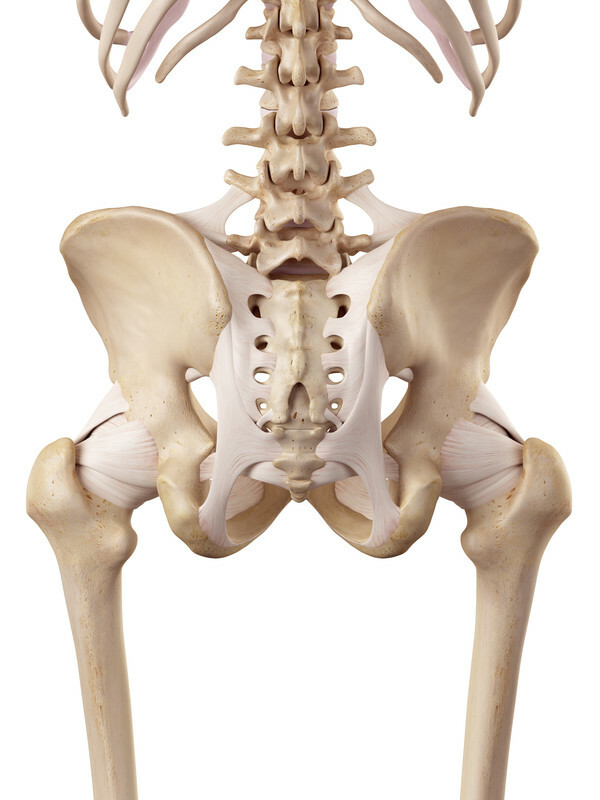 We recently saw a patient whose hip looked just like we described above. The physical exam proved limited external and internal rotation, and the x-ray the patient brought confirmed bone spurs. It was these extensive osteophytes that were preventing the full range of motion in that patient’s hip. Bone spurs do not always preclude someone from doing well with Prolotherapy, however, much depends on the extent, size and location of the spurs. Unfortunately, we had to refer this particular patient for hip replacement, but he went into it with full knowledge of the extent of his degenerative joint disease and the confidence that a conservative care clinic had recommended it. 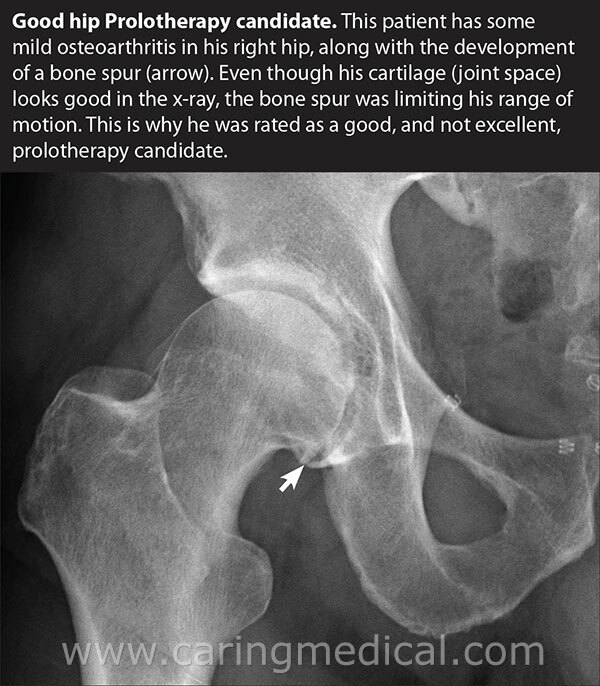 This case shows that a second opinion from a non-surgical viewpoint can provide the patient with a level of confidence that a hip replacement is really warranted in their situation. The message of this article is to receive a second opinion on your hip replacement recommendation from a doctor who specializes in non-surgical approaches like Prolotherapy. Many times the vast majority of our patients are able to eliminate their painful joint conditions without surgery. A discussion on advanced hip osteoarthritis – When do we use stem cell therapy? As we mentioned earlier in this article, we do not use stem cell therapy on every patient. While this treatment is presented as leading and cutting edge, we have found of the years of offering stem cell therapy, that it is not needed in many cases. In some cases however, it is. Here is one such case. This is a case history of a patient who had a long history of pain in both hips. She had tried numerous treatments including chiropractic, cortisone injections, and even multiple Prolotherapy sessions at another clinic. The patient had severe osteoarthritis in her hips and was looking for an alternative to total hip replacement when she was referred here. She decided to have a consult with us as she understood we specialize in difficult cases. 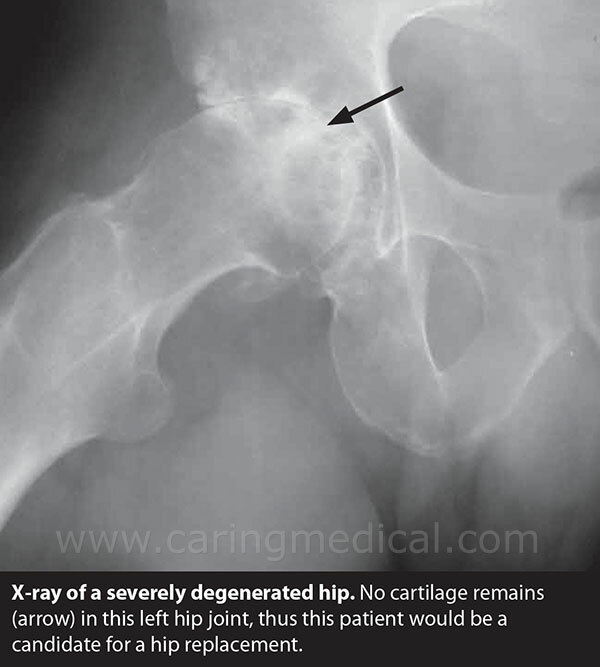 The patient’s X-rays and physical exam confirmed severe osteoarthritis in both hips. In many cases dextrose Prolotherapy will eliminate all or most of the pain associated with this disease, however, severe cases are more difficult. We will continue this case after a few explanatory notes. One of the determining factors that point to the severity of the arthritis is the range-of-motion that remains in the joint. This patient had zero degrees of internal rotation and 25-30 degrees of external rotation, very limited. When we see an advanced case of osteoarthritis or a patient after normal Prolotherapy has not met their goals, we may suggest PRP or stem cell treatment for hip osteoarthritis. Stem cell therapy is a procedure where the patient’s own bone marrow is extracted via a simple, fairly painless procedure from their shin bone, or tibia. Bone marrow contains stem cells, cells that differentiate, or change, into any other types of cells in the body, according to what is needed. This occurs naturally in the body, but the premise of Stem Cell Therapy is to inject the bone marrow containing stem cells right where it is needed. 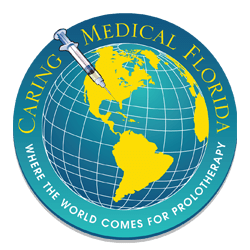 Prolotherapy is also done at the same time to help repair ligaments around the hip to stabilize them, as it is often joint instability that leads to uneven wear and tear of the cartilage. Following stem cell therapy from bone marrow, our case history patient reported 20% improvement after the first treatment, 70-80% improvement after the second, and has been cycling ten miles per day nearly every day. Stem cells and progenitor cells from bone marrow have been shown to “revascularize” or make new blood vessels around an area of injury. This highway of new vessels, attested to by research from Tufts University School of Medicine (10), brings the healing elements to the site of injury. Progenitor cells are similar to true stem cells in that they can replicate themselves, but only a limited number of times, unlike stem cells, which can do so indefinitely, given the right conditions. Stem cells have been shown in studies to differentiate into cartilage cells and are used to repair cartilage defects. This was demonstrated in research from Cornell University published in the Journal of bone and joint surgery (11) and Orthopaedic Arthroscopic Surgery International, Bioresearch Foundation, in Milan, Italy publishing in the journal Cartilage (12). In this case series, we describe our experience with a simple, cost-effective regenerative treatment using direct injection of whole bone marrow (Stem Cell Therapy) into osteoarthritic joints in combination with hyperosmotic dextrose (Prolotherapy). Seven patients with hip, knee or ankle osteoarthritis received two to seven treatments over a period of two to twelve months. Patient-reported assessments were collected in interviews and by questionnaire. All patients reported improvements with respect to pain, as well as gains in functionality and quality of life. Three patients, including two whose progress under other therapy, had plateaued or reversed, achieved complete or near-complete symptomatic relief, and two additional patients achieved resumption of vigorous exercise. As far back as 2006, an article in Pain Physician Journal featured a case study of successful cartilage regeneration using stem cell therapy. 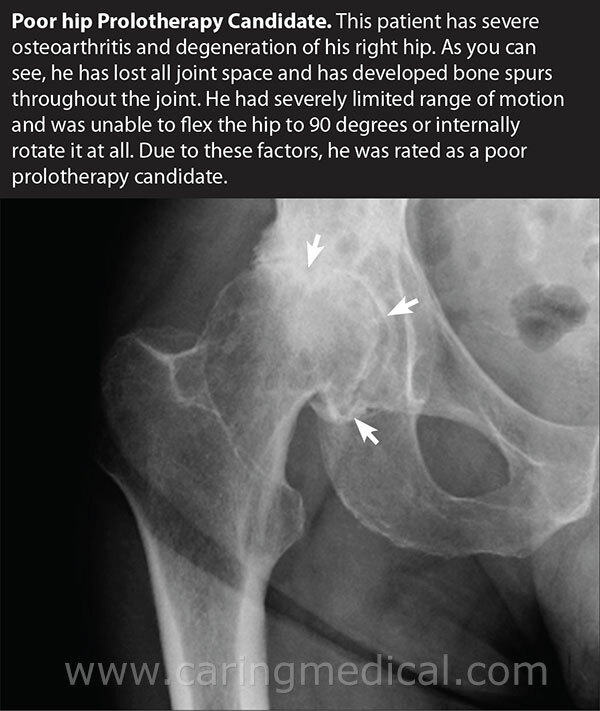 (17) This case involved a 64-year-old man with a 20-year history of hip pain. He was a candidate for hip replacement as his MRI showed severe degeneration, decreased joint space, bone spurs and cysts. This man underwent a stem cell transfer in an effort to regenerate cartilage in his hip. Bone marrow was extracted from this patient, processed and injected into the affected hip. After the first stem cell treatment, the patient reported some improvements in his hip although the MRI showed no change. One month later a second treatment was performed and resulted in increased joint space and increased range of motion. The patient reported that he was able to stand for longer periods of time, enjoyed travel and recreation and was able to walk further and sit with less pain. The researchers concluded that this man did, in fact, have cartilage regeneration and that bone marrow therapies hold great promise for joint degeneration.